Description: Custom crafted of Solid Brass, this delicate design features pine needles and and the pinecone, which is considered a sacred symbol throughout history and the epicenter of enlightenment. Rustic charm comes alive with soft warm ambient light projected through stunning Beige art glass, which is complemented by Craftsman Brown finished hardware on this nature inspired fixture. 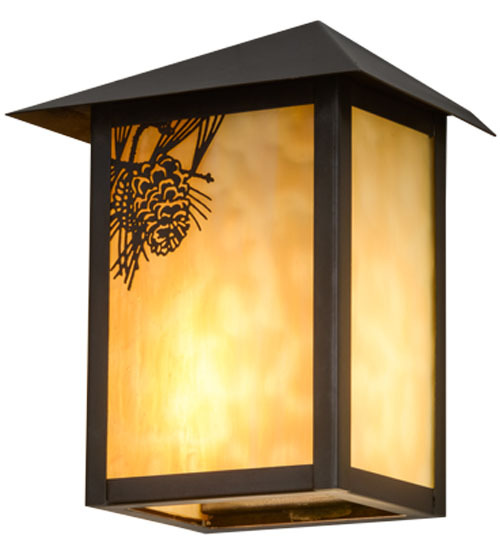 This Craftsman Signature lantern is ideal for both exterior and interior lighting applications. The fixture is handcrafted by Meyda artisans in our manufacturing facility at the foothills of the Adirondack Mountains. Custom sizes, colors, styles and dimmable energy efficient lamping options are available.